Question: Hi Chad, I have read many of your articles and books and I appreciate the insight that you have provided me and others. My question is regarding the standard bench press. I am an amateur mma fighter with aspirations of competing at the pro level and an avid weight lifter. It is no surprise that I have become attached to the bench press, but after reading some of your work I question its usefulness. So my question is this: does the bench press or exercises like it (incline, decline, db) have a place in a fighter’s program? Would you recommend I focus on vertical pressing movements, dips, and maybe standing cable presses. Any info you can give me would be greatly appreciated. CW Answer: The bench press is a very polarizing exercise, much like the barbell squat. On one hand, the bench press has been a mainstay in strength building programs for 50 years, and most guys love to do it. On the other hand, when you consider the alternative exercises to train the same muscle groups, the bench press is not a very good choice. The problems with a typical barbell bench press arise when you look at the structure and function of the shoulder joint. 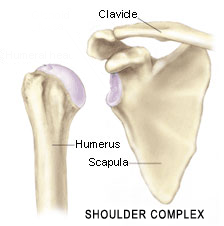 The shoulder complex consists of the scapula, clavicle, and humerus. It’s the collective movement of these three segments that lead to the greatest gains in strength while preserving or improving joint health. So what’s wrong with the bench press? Your scapulae (shoulder blades) are locked into place during the movement. This creates imbalances since the muscles that move the scapulae aren’t recruited. Second, the lack of scapular movement puts excessive strain on the soft tissue around the anterior portion of the shoulder joint. Anyone who’s spent any effort on the bench press knows exactly where this shoulder pain is. Even though there are dozens of bench press variations that incorporate dumbbells and various angles, the overriding problem is still the same: there’s very little scapular movement. One muscle in particular, the serratus anterior, is essential to build punching strength and improve your shoulder health by holding the scapulae in their proper position. When you throw out a long jab toward your opponent, the serratus muscle is what gives you that powerful “pop” at the end of the movement. The bench press when performed with the shoulder blades pulled back and locked into place all but eliminates this important muscle. So does a fighter need the bench press? No. There are more effective ways to strengthen the muscles that surround the shoulder complex. You should focus on upper body pushing exercises that allow your shoulder blades to move freely, thus activating the serratus anterior. Now for a simple drill. Make a knuckle with each fist and hold your arms straight out in front. Next, push your knuckles another 3-4 inches forward and feel your shoulder blades move apart. 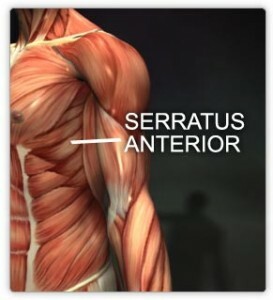 This is the movement that recruits the serratus anterior. Any typical barbell or dumbbell bench press, when you’re lying on your back, doesn’t allow for full scapular movement. Plus it doesn’t engage the core and hips as much as some of the other alternatives. To have a strong punch you must have strong hips and a strong core. That’s why I use the one-arm floor press with rotation to build a fighter’s punching power. This exercise allows for full scapular movement and it builds strength in the hips and core. In addition to the one-arm floor press with rotation, I use many variations of the push-up, handstand push-up, and standing cable chest press. The key with those variations is to push past the normal end range of motion to spread your scapulae. Remember, the humerus, clavicle, and scapula are designed to move together so you should train exercises that allow for natural, fluid motion in the shoulder complex. I’m also a huge fan of dips from rings. With rings you can gradually increase the range of motion to the point where your thumbs touch the outside of your pecs when you’re in the bottom of the movement. Building strength through this full range of motion is excellent for improving shoulder mobility strength that lasts. Ever since I started using the rings exclusively for my upper body work I haven’t had to stretch my pecs and my shoulder health and mobility is better than it’s ever been in my life. That’s why I use rings with all the athletes I train. The only people who should train a traditional bench press on a regular basis are powerlifters. If you’re not a powerlifter stick to variations of the push-up, handstand push-up, standing cable chest press, dips from rings, and the one-arm floor press with rotation. If you want to learn my system for building explosive power, check out my upcoming seminar in Phoenix, AZ on February 2-4 by clicking this link. CW: Any push-up variation where you push through an extra few inches of motion at the top to spread your scapulae is a good place to start. Dips on rings aren’t necessarily great for the serratus but they’re good for shoulder mobility. Very inspired article – a lot of takeaways! Especially liked the anatomy break down and the advice on incorporating the serratus with full range of motion for upper body exercises. Hearing about your new-found shoulder health is intriguing. I’d be interested to learn more about what you’re thinking these days when it comes to upper body training and performance. CW: Thanks, I’ll cover that info in my upcoming book. Question: Does this only apply to a bench press or does this also apply to doing heavy weighted pushups in a 5×5 type of routine? Also another question, you say to do them on rings, what are your views on doing the Dips on top of a swing or something where there is only one bar and it is parallel. Like doing a muscle up on a pullup bar you do a pullup and then you do a dip but on a pullup bar. Well what are your views on dip pullup bars? CW: Heavy weighted push-ups are the way to go since they allow for scapular movement. If I understand your dip description correctly, it sounds like it could be overly stressful to the shoulder joint. Chad-Would doing a floor press with your legs straight out be a good alternative? thanks for your time. Excellent article!! CW: No benefit in doing it with the legs straight. CW: I’ll cover that info soon. Don’t want to post all that info in this answer column. Thanks Chad this is exactly what I was looking for, a simple answer backed up by science. I look forward to your future works. What exercises should I use to get a big chest? Is standing cable chest press and weighted dips the only exercises I need? CW: Those are two of the best. Also, I like push-ups with your feet elevated on a swiss ball. CW: Do push-ups with your feet elevated on a swiss ball and attempt to pull your hands together (even though they won’t move) as you push up. You’ll feel intense pec activation right away. Chad, I really like your way of thinking. I have a couple questions regarding the exercise shown in the video (one arm floor press). – Is alot of the body weight resting on the back of the head? Is this dangerous when the weights get heavy or when the sets get long? – What to do when the kettlebells are becoming too light? The heaviest we have are 88 lbs a piece. CW: No, there’s not a lot of weight resting on the back of the head. 88 lbs is plenty for this exercise. Add reps over time. 1) Isn’t it difficult to use a heavy load with this exercise because of the awkwardness of the position? 2) Should you still attempt to retract the scapulas while pressing with this exercise? Thanks Chad. Definitely an exercise I want use more often. CW: Yes, you should use less load and that’s not a bad thing. It’s a complex exercise that builds strength and muscle with less weight than a traditional floor press. Push your knuckles as high as possible at the end of the press to activate the serratus. Chad, Thank you very much for the quick reply. What is your opinion on a standing pushing exercise with the landmine? I personally love it. P.S. I now got my copy of your Huge in a Hurry book (the English version, not the German one) and it is a fantastic read! So what about dips on parallel bars? Do they help with shoulder mobility the same as rings? CW: No, rings are much better because they’re less stressful to your shoulders.